The Alldocube Thinker i35 is a surprising laptop, showing that Chinese manufacturers are bold enough to try new things. The combination of a Core m3 CPU and a 6-megapixel display is lethal, at least for the competition. The last time we reviewed a product from Alldocube (formerly known as Cube), we noted that the iWork 1X 2-in-1 tablet PC in question was an average performer but with a shockingly low price. At the time of the review, it was the cheapest Windows convertible device to offer 4GB of RAM and 64GB on-board storage until it was discontinued. Online Chinese retailer, Gearbest, sent us the sample and sells the Alldocube Thinker i35 for just over £450 ($590) at the time of writing. Note that, while this price includes delivery, it is exclusive of any taxes that may be levied by HMRC or the courier companies on behalf of the vendor. Want to buy tech from online Chinese retailers? Read this first. But with the Thinker i35, the Chinese startup is aiming higher with components, build quality and a price tag that are squarely aimed at the more lucrative mid-market segment. The Thinker i35 reminds us of a more posh version of the Chuwi LapBook 12.3. 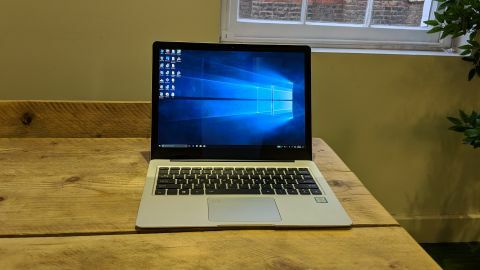 Alldocube’s designers opted for a magnesium alloy for the laptop’s chassis; open it up and you will come face to face with a massive 13.5-inch LCD panel, the same as Microsoft’s Surface Book. It is a touchscreen model with a 3000 x 2000 resolution, the highest on any non-branded laptop we’ve tested to date, quite a feat given the relative anonymity of Alldocube. Pushing almost triple the amount of pixels of a Full HD panel is likely to mean the on-board graphics subsystem will suffer. What makes the laptop a bit more peculiar is its 3:2 aspect ratio, which means that vertically, it almost matches the resolution of a 4K display (2K vs 2.16K pixels). You end up with a squarer shape than a traditional widescreen, of course, with the display and the surrounding black bezels covered with glass, looking a lot like the 12.9-inch iPad Pro. That translates into a larger-than-average footprint. At 313 x 237 x 14mm and with a weight of just under 1.7kg, this notebook is chunkier than we’d expect. ‘Dense’ is the word we’d use to describe what one might feel when lifting this model up, partly due to the full-metal body. The screen is a touch model which explains why the display is so reflective. Other than the Thinker logo on the outside of the display panel, there’s no allusion to the Alldocube brand anywhere on the i35’s chassis. The dual speakers are located underneath (or behind) the long hinge that welds the panel to the base unit. There’s one USB 3.0 port on each side with a Type-C connector available as well (plus an audio connector). The USB Type-C connector can be used for charging and for display/data as well. There’s no HDMI connector or card reader, an aspirational move more in line with Apple’s minimalist approach than Microsoft’s. Note that there are no fans as the entire underside of the laptop acts as a heatsink, although Alldocube has positioned four rubber feet on the bottom to elevate the base and facilitate air circulation. The fully laminated IPS display remains the star of the show: it is bright, and jaw-dropping in all its crispiness – thanks to a high pixel density (267ppi) – plus it’s great at color reproduction. As expected, it supports the Microsoft Surface Pen N-Trig since it shares the same digitizer technology as the Surface Book. However, six million pixels requires a significant amount of graphics firepower and that’s the reason why something a bit beefier than the usual Pentium CPU was adopted. Behold the Intel Core m3-7Y30, a processor that carries a $281 suggested retail price, and packs an Intel HD Graphics 615 video subsystem. There’s also 8GB of system RAM (low power DDR3) and a 256GB SSD, albeit a SATA3 model rather than PCIe. Wireless connectivity (Bluetooth and 802.11ac Wi-Fi) is handled by another Intel chip, the Wireless-AC 3165, and there’s a 2-megapixel camera on the top bezel, located between two microphones. The 50Whr battery is powered by a 12V/3A (white) power supply unit. It would have been great if the latter was designed as a monoblock, similar to the Xiaomi Mi Notebook Pro.